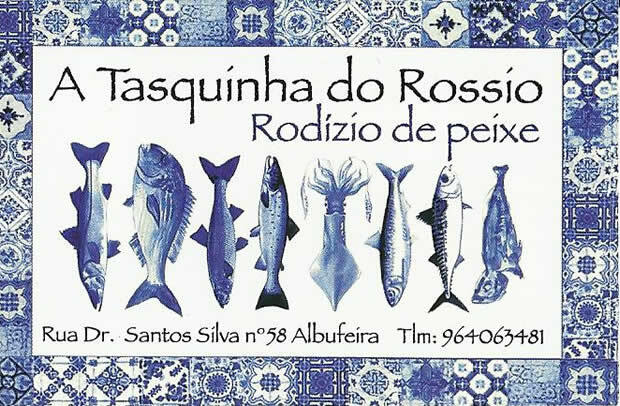 I’d read about A Tasquinha do Rossio on TripAdvisor before arriving in Portugal and was very much looking forward to eating there. It sounded fantastic, i’d also read that it gets busy quickly so I went out of my way to find it during the day and make a reservation for later on. I’m glad that I did because when we arrived at 7pm all of the tables outside had ‘Reserved’ signs on them! It’s a small place with just a few tables inside and maybe 10 outside. There are no menus, just a blackboard advertising a couple of specials and the fish rodizio which the restaurant is known for. 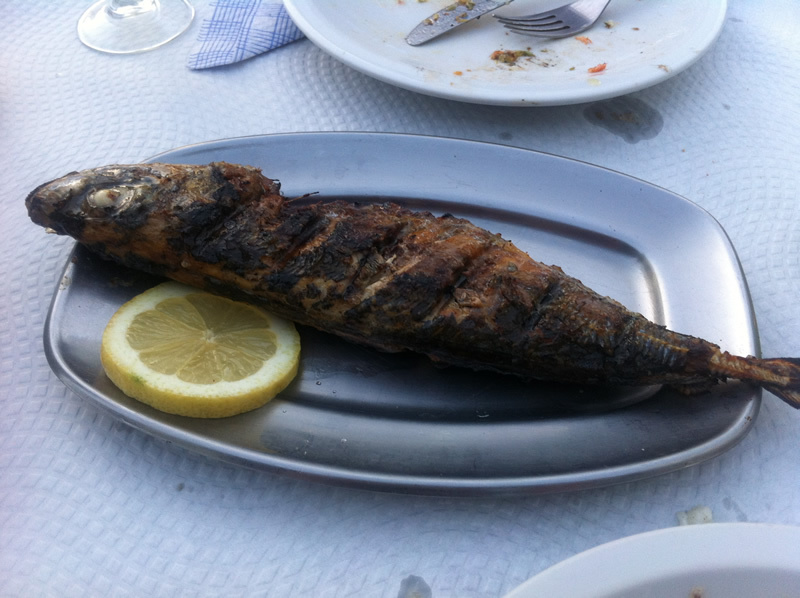 Of course we went for the fish rodizio which is a series of fish cooked simply over charcoal and served individually. Before the fish arrived we enjoyed the usual Algarve ‘couvert’ of bread & olives and the popular sardine pate when we were brought a fresh crab pate which was absolutely stunning. 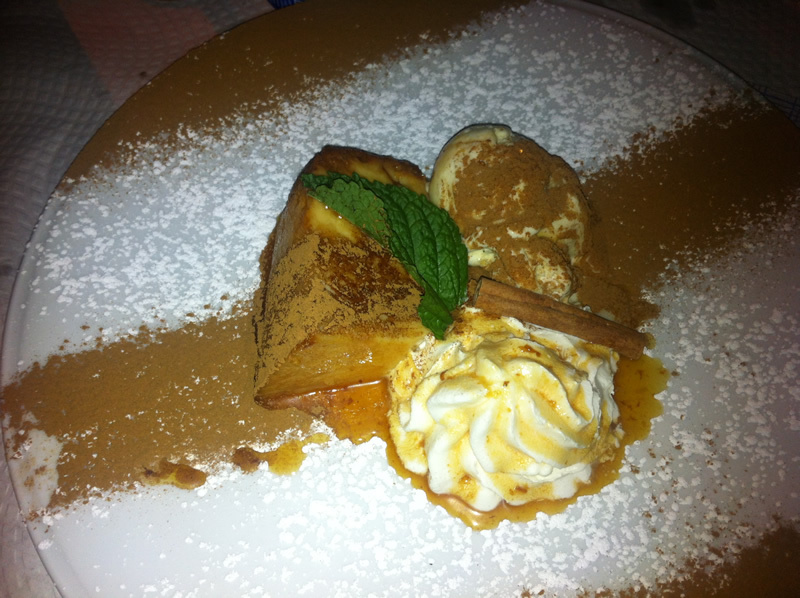 Definitely one of the best things i’ve tasted for a long time, just so light and tasty, it didn’t last long. 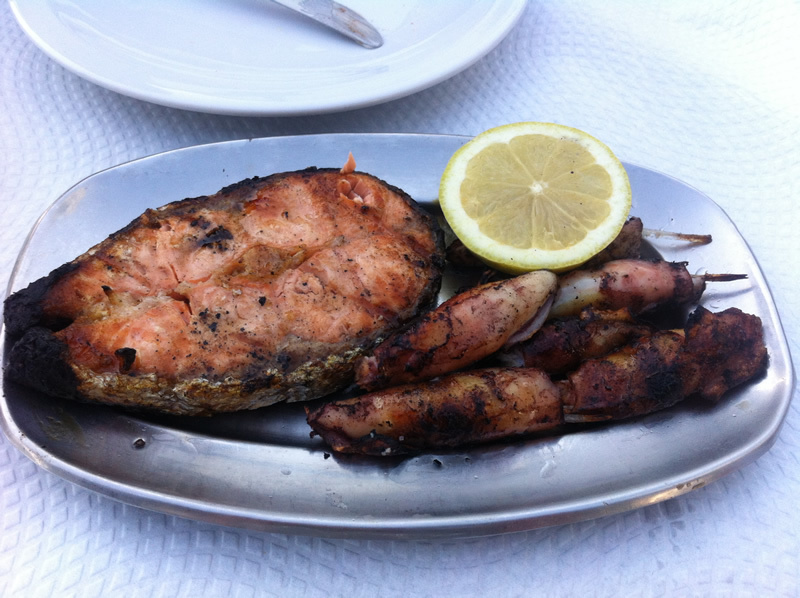 We were then brought our first serving of fish: a tray of salmon steak and baby squid, both were cooked amazingly well. Juicy & moist inside but with an incredible BBQ char on the outside giving a great smoky flavour. Shortly after that salmon & squid was finished we were brought a whole mackerel which was also nicely blackened on the outside but perfectly soft and moist on the inside. 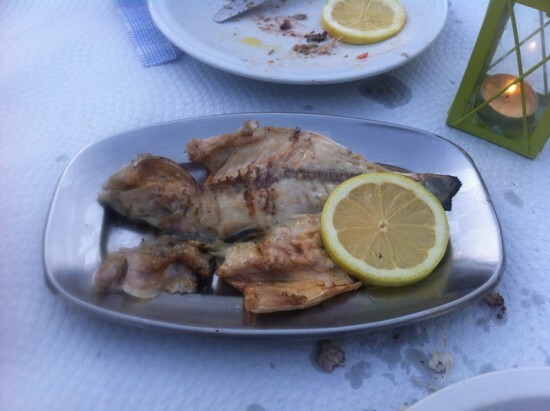 Next was a beautiful sea bass and finally golden bream, both were as well cooked and delicious as the rest. 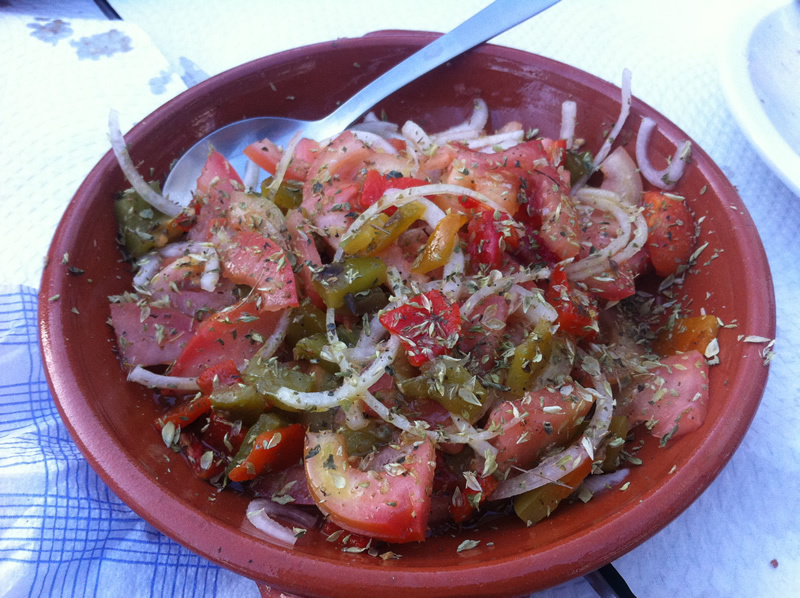 The fish was served with potatoes and an ‘Algarve salad’ which is sliced tomatoes with onion and oregano which is absolutely delicious. It’s a popular dish in many of the restaurants we ate at but this was as good as any, probably the best in fact. When it was finished it was replaced almost immediately and free of charge. The desserts are apparently all made by the owners mother. We ordered a cheesecake which was very nice and a creme caramel which was even better and covered in cinnamon which I just loved. Service slowed a little as it got later and the restaurant got busier, we ended up spending well over 2 hours there and it looked like there were only 2 people working which really isn’t enough for a full restaurant peak season. The staff were very friendly and always attentive but it was just difficult to get their attention sometimes as they were so busy. The slightly slow service wasn’t enough to put a downer on the night though. Not only was everything we ate at A Tasquinha do Rossio fantastic but the house white wine was gorgeous too and cost just $10! In fact the whole meal was just unbelievably good value, it’s one of the few times i’ve looked at a bill and been surprised that it’s so low.